It’s hard to concentrate on finding a topic for this Tuesday Stretch after hearing of the tragedy of the Las Vegas shooting, but I’ll have a go! BugDoc Dave here. I’ve had a lot of fun reading the travel adventures of Kathi and Galen. [And yes, I love some of the decorations that folks from the 1880s into the 1920s did with butterfly and moth wings! In fact, I collect some of the South American trays, jewelry and other trinkets made using butterfly wings.] 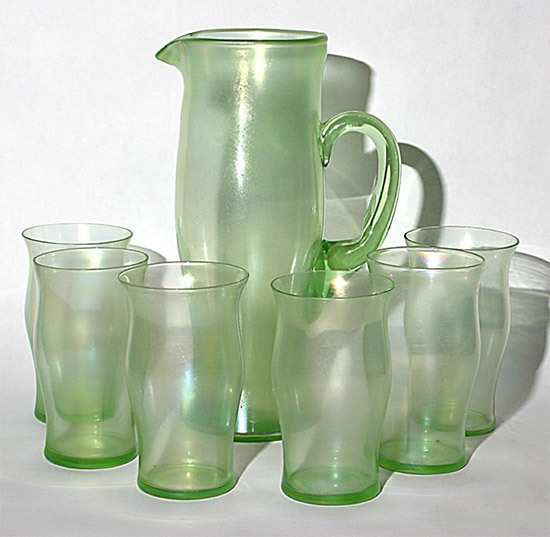 In my last discussion, I talked about the iridized glass made by Consolidated Glass Company and mentioned that the vases were made using the same blown-molding technique of Diamond for some vases and pitchers. 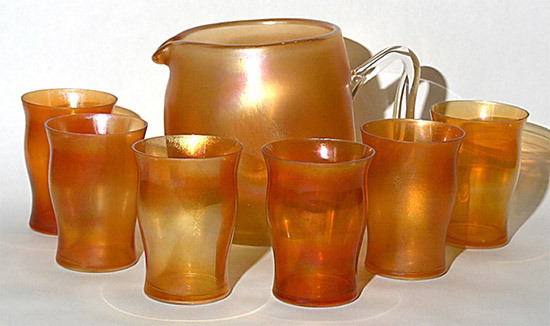 Tonight, I want to talk about more of the Diamond pieces, specifically their pitcher and tumbler sets. These are very often mistaken for art glass and none are really common. Probably the most recognizable sets (for carnival collectors) are the so-called “Pastel Panels” sets. I’m including a green set. The problem that I have with this name is that Hartung drew a line drawing of the tumbler, but her drawing of the pitcher was of an Adam’s Rib (#900) pitcher! Apparently, she didn’t associate the true pitcher with the tumbler. Remember, there are #900 tumblers (actually handled mugs) that really go with that pitcher! What is interesting to me is that the tumblers have concave ribs on the outside while the pitcher of this set has optic ribs (inside). The tumblers were “stuck up” which means that their bases will be ground while the pitchers are blown-molded and they have a snap base that was used for final shaping and applying the handle. These usually come in green or blue, but I keep hoping to find one in Afterglow (pink)! Speaking of the Adam’s Rib set, I’ve shown these before, but it never hurts to see them again! 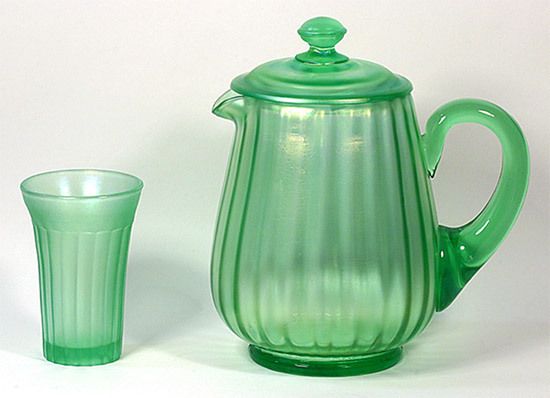 This set is in blue, but a green set is also known. Again, I find it interesting that only the handled mugs are known in stretch while there are some non-handled mugs in non-iridized sets. 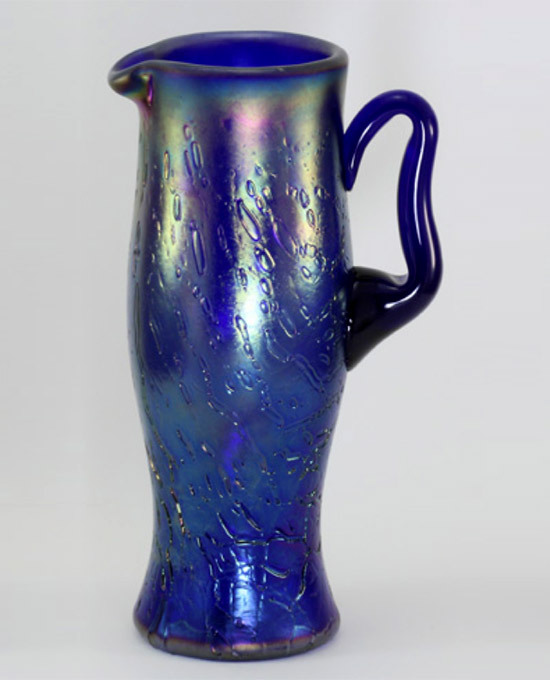 There are several of the blown-molded pitchers that often have a distinctive point at the top of the handle. I’m including a example of a “Blue Crackle” (cobalt blue with impressed crackle design). 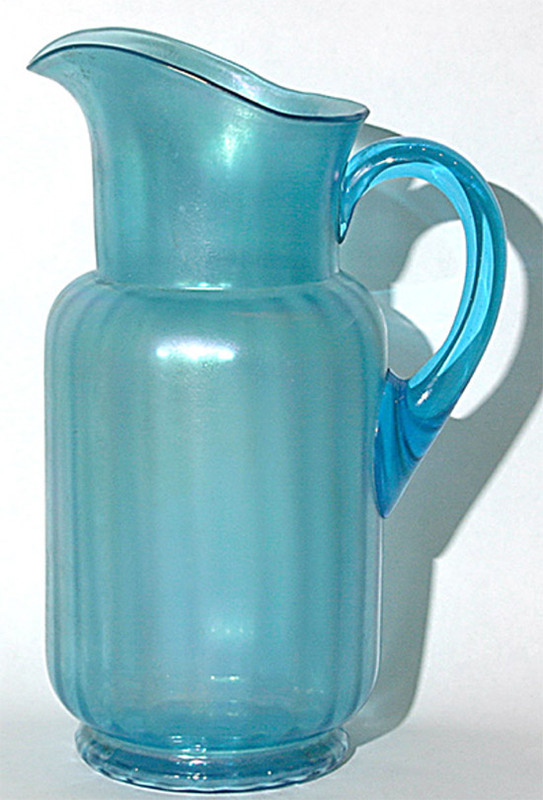 The blue and green examples occasionally come with some very thin-walled tumblers that have a distinctive bulge in the middle. 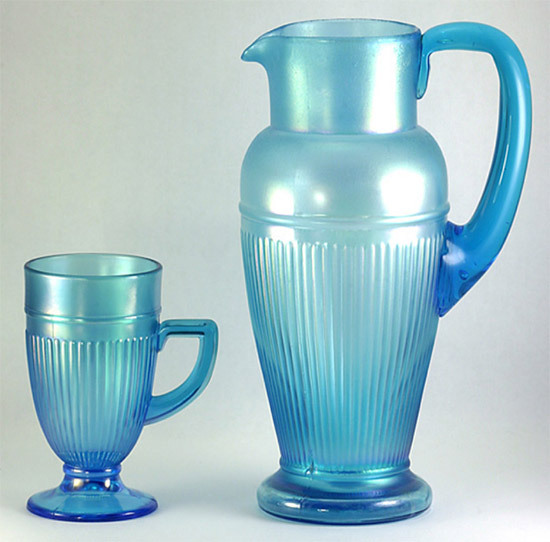 A crystal pitcher with a topaz handle and a blue pitcher with a topaz handle are also known, but I’ve never seen crystal stretch tumblers. A squatty pitcher is also known and these appear to be matched with the same thin-walled tumblers that have the same shape, but are shorter. Here is a set in marigold. Finally, I have one blown-molded pitcher that has optic rays inside, and I’m pretty sure is of Diamond’s production. It is in blue stretch glass. Enjoy!